6 digit electromagnetic impulse counter with reset button and reset lock-out. 12 - 24 vdc. 8-1/2" wire leads. New!! Redington Counters Inc. Tachometer. Counts 5 - 30 vdc pulse / revolutions. This counter indicates divided or multiplied number of input pulses. Internal switch adjustments set-up / divide / multiply function. Power requirements = 5 to 24 vdc. 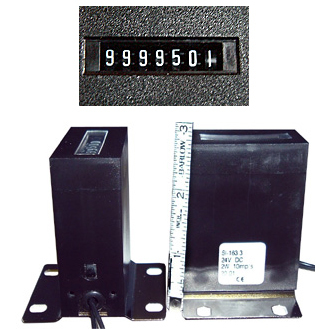 Military grade event counter advances one digit each time voltage is applied and then removed. Perfect to count number of times equipment is turned on. 28 vdc. Counts 99,999 events Mounts from rear in 7/8" hole. Includes hardware. 3/4" depth. New. Current cost is over $425 each. 24 vdc, 2 watts. Can count as fast as 10 impulses per second. Use this counter to log activations of any type of powered equipment. 2-1/8"W x 31/32"D x 2-5/8"H (+ flange). Surface flange mount. 12"L wire leads. Made in Switzerland. Same as above but 48 vac, 50 Hz, 5 va.
Western Electric resettable counter. 48 vdc. 0 - 999 capacity. KEP style, KT344. Veeder-Root totalizing event counter. 0 - 99999. 24 vdc, 1.5 watt. 2.187" x 2.187" x 2.372" deep. 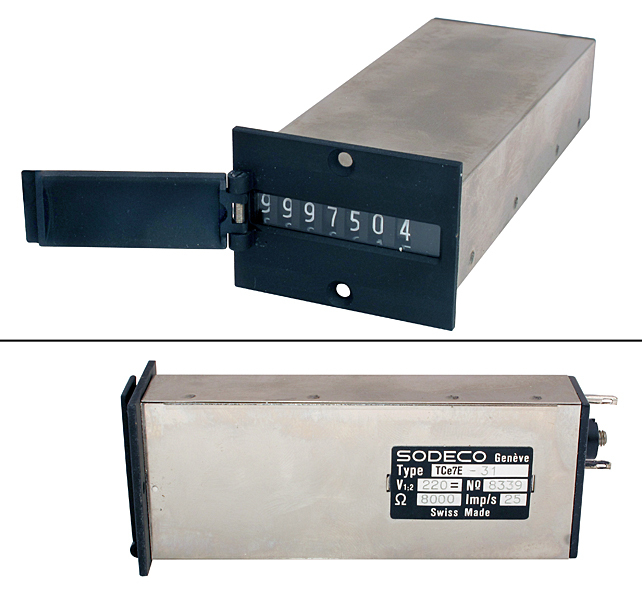 Sodeco Impulse counter. 220 vac, 8,000 ohms. Comes with about 2,500 impulses short of turning over for burn-in. Up to 25 impulses per second. 1-1/4" x 1-5/8" front flange. 4-1/2" deep behind. 1-9/16" x 13/16" wide. Swiss made. Brand NEW! !